At Little Creatures we love a hoppy beer and for our latest creation we are bringing you a hop triple threat using three hop varieties in the kettle and dry hopping with three varieties for an aroma reminiscent of a delicious seasonal fruit salad. 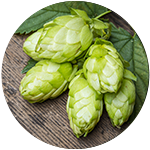 The upfront hoppy aroma comes from our trademark US hops and we went a bit overboard with hops and are using a blend of Galaxy, Mosaic and Citra for the dry hop – with the Mosaic and Citra being Cryo Hops (Pelletised Lupulin Powder). The result, a lot of the green matter is removed so you get less vegetative character, which makes for a cleaner, more refined dry hop character.” All in a damn tasty beer fit for all occasions. The low bitterness of this little beauty makes for an easy drinker that is best enjoyed Monday, Tuesday, Wednesday all the way through to Sunday.